A cornerstone of the Hometown Bicycles culture is doing right by the community that has done so much to support us. 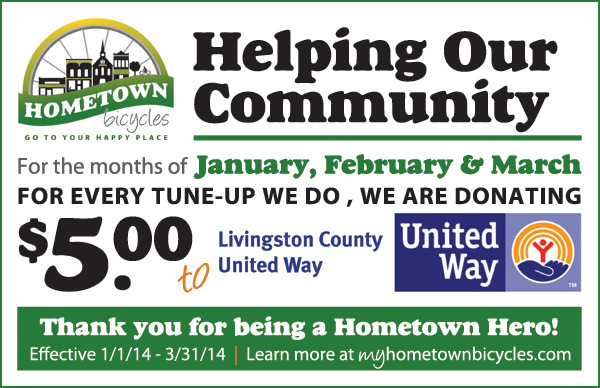 So, for this January, February, and March, $5.00 of EVERY tune-up we complete (and have completed) at both our Brighton and Whitmore Lake shops is being donated to Livingston County United Way, whose Basic Needs programs directly benefit our community. You can be a part of it by bringing in your bicycles. Thanks for being a Hometown Hero! With our second store opening in just a couple weeks, we’re looking for more good people to join our crew! So, check this out… if you have some spare time, enjoy hanging out with bike geeks, and love helping out the folks in your community, APPLY! Stop by the Brighton store for an application, and talk to Shaun. WOW. What a great response! We’ve been filling up the seats, and packin’ in the learning at our Hometown bike clinic series. Thanks to all you awesome attendees! Next week’s clinic covers one of the hottest topics in cycling: “Cycling Fitness & Nutrition”, led by the Body Within gurus. Learn exercises, stretches, and foods that will help you avoid injury and maximize your cycling health benefits and efficiency! Because space is limited, we ask that you call ahead to reserve your spot: (810) 225-2441. If you can’t make one, join us for the other!